The projected shortfall in Medicare has fallen by almost 70 percent since 2008. The 2013 Social Security and Medicare Trustees’ reports were little changed from 2012. The Social Security Trustees report showed a slightly larger shortfall over its 75-year planning horizon, with the projected shortfall rising from 2.67 percent of payroll in the 2012 report to 2.73 percent of payroll in the newest report. The reason for this small increase was the change in the 75 years covered with 2087 replacing 2012 in the projection period. The projected date of trust fund depletion remained at 2033. After this date the program is projected to be able to pay slightly more than 75 percent of scheduled benefits if no changes are ever made. This ratio changes little over the remaining decades of the projection period. The Medicare report had some positive news in that the projected shortfall dropped slightly from the 2012 report. In 2012 the projected shortfall was 1.35 percent of payroll. In the 2013 report it was down to 1.14 percent of payroll. The main reason for this decline is a slower rate for the projected growth in health care costs. The 2012 report assumed that per person Medicare expenditures would average $16,530 in 2021. The 2013 report assumes that per person expenses in 2021 will be just $16,276. This projection incorporates some of the slowdown in health care cost growth that we have seen over the last five years. The improvement in the trustees projections for Medicare over the last five years have been striking. In the 2008 report the trustees projected a shortfall equal to 3.54 percent of payroll. This means that projected shortfall has been reduced by almost 70 percent since 2008. This is in spite of the fact that the change in the projection period would have added at least 0.2 percentage points to the projected shortfall. One item that is often missed in the discussion of these reports is that projections of higher future costs for these programs is accompanied by projections of higher wages. Both reports include explicit projections of real wage growth in their analysis. Over a long enough time, even modest wage growth will have a large impact on living standards. The trustees’ wage growth assumptions imply that the average real wage in 2045 will be over $68,000 (in 2013 dollars), or 55 percent higher than the $43,800 average real wage in 2013. In addition, because the trustees assume that the average work year will fall modestly through time, workers on average will enjoy the equivalent of four more days of vacation each year than workers today. If the trustees’ assumptions about the cost of these programs prove correct and even if the projected shortfall in the programs were to be met entirely through a 5.12 percentage point increase in the payroll tax (as opposed to alternative sources of revenue or cuts in benefits) then the projection of rising wages would be little affected. 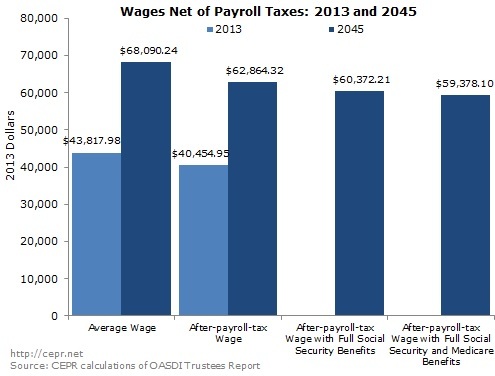 Average annual wages, after deducting payroll taxes, would still be more 46 percent higher in 2045 than in 2013 ($59,400 in 2045 compared to $40,500 in 2013). It is important to emphasize that these numbers refer to average wages. In the last three decades, the vast majority of wage growth has gone to those at the top end of the wage distribution. As a result, workers at most points along the wage distribution have seen little gain in real wages over this period. If this pattern of upward redistribution continues, workers in 2045 will see little, if any, gain in real wages. In that case, the effect of the distribution of wage gains over the next three decades will swamp the impact of any tax increases that may plausibly be implemented to support Social Security and Medicare. It is also worth noting that even in this scenario, the projected increases in payroll taxes over the next three decades would not be hugely different than over the last three. Since 1980, the Social Security tax rate has increased by 2.24 percentage points (or about 2.8 percentage points when factoring in the higher rate on the self-employed) and the Medicare tax rate has risen by 1.9 percentage points. The total effective increase in the payroll tax since 1980 of 4.7 percentage points is only slightly less than the 5.1 percentage point increase for 2045, assuming no other changes in the programs, that would be implied by the projections in these reports.